Brain function is a delicate balance of neuronal excitation and inhibition. The schematic diagram above illustrates inhbitory neuronal responses mediated via the neurotransmitter GABA, and how these are affected by the neuronal Cl- transporters KCC2 and NKCC1. In neonatal neurons (left, A), KCC2 is absent and NKCC1 mediated Cl- influx results in GABA mediated depolarization and excitation. In most adult neurons (middle, B), KCC2-mediated Cl- efflux dominates Cl- homeostasis resulting in GABA mediated hyperpolarization and inhibition (A&B adapted from Ben-Ari, 2002). 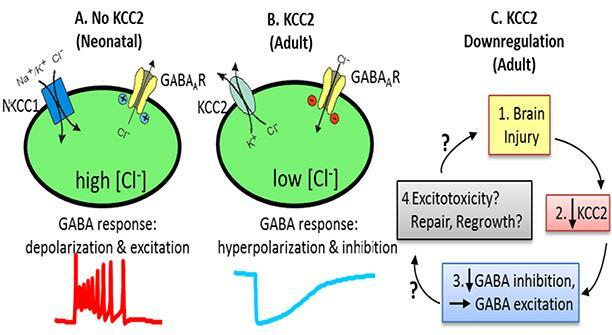 (C, right) KCC2 is downregulated after adult brain injury resulting in a conversion of GABA response back towards the immature depolarizing phenotype. This research project proposes that loss of KCC2 is a key event in the pathogenesis of temporal loe epilepsy and the maintenance of spontaneous seizures.